FOR FULL PERFORMANCE WITH AUDIO, PLEASE CONTACT WPA. George Hamilton introduces Paul Simon and Art Garfunkel. FOR FULL PERFORMANCE WITH AUDIO, PLEASE CONTACT WPA. Simon and Garfunkel perform "Homeward Bound". FOR FULL PERFORMANCE WITH AUDIO, PLEASE CONTACT WPA. George Hamilton comes out and tells Simon and Garfunkel he really loves that song. FOR FULL PERFORMANCE WITH AUDIO, PLEASE CONTACT WPA. Mel Carter performs an excerpt of "All Of A Sudden My Hearts Sings". FOR FULL PERFORMANCE WITH AUDIO, PLEASE CONTACT WPA. George Hamilton formally introduces Mel Carter. FOR FULL PERFORMANCE WITH AUDIO, PLEASE CONTACT WPA. Mel Carter performs "Love Is All We Need". FOR FULL PERFORMANCE WITH AUDIO, PLEASE CONTACT WPA. 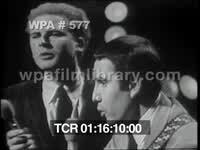 George Hamilton and Mel Carter perform "Memphis, Tennessee". FOR FULL PERFORMANCE WITH AUDIO, PLEASE CONTACT WPA. George Hamilton introduces The Young Rascals at Hullabaloo a Go-Go. FOR FULL PERFORMANCE WITH AUDIO, PLEASE CONTACT WPA. The Young Rascals perform "Good Lovin'". FOR FULL PERFORMANCE WITH AUDIO, PLEASE CONTACT WPA. George Hamilton closes the show. Credits roll as the Young Rascals continue Good Lovin'. Credits end; good shots band and dancers getting into it.